We once again spoke with Eamonn from Green Coast Rubbish. This time though, our main focus was on plastic recycling and the opportunities surrounding the industry. Check out our first interview with Eamonn here if you have not read it yet. 1. How is the industry looking right now? - Speaking from a locally focused point of view, I am encouraged by the progress and direction of our our regional plastics recycling options and programs. Most notably, the North Shore Recycling Drop-off Depot. The depot is a comprehensive facility that takes most numbered plastics, soft plastics, overwrap plastic and a host of other material types. This combined with our municipal Blue Box program puts the North Shore well ahead of the curve when compared to other regions in the Lower Mainland. 2. What is your involvement in plastic recycling? Any specific types of plastics? 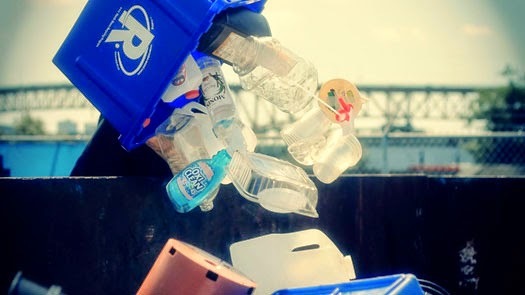 - Plastics are just one of the many material types that we recycle. We remove and recycle all numbered plastics (HDPE, PET, V, LDPE, PP & PS), which includes hard and soft plastics as well as Styrofoam. In 2013, we recycled 110 cubic yards of Styrofoam and over 2 tonnes of plastics. 3. Does your company mainly focus on plastic recycling? If not, what does your company focus on? -Our primary focus is not on plastics recycling, however, plastics are one of the many materials that we remove and recycle for our various commercial and residential clients. - As I mentioned, we do not focus on recycling one type of material, but we do provide our clients with a service that strives to find the best end use through recycling, donation or resue for all material types that we remove, which includes: furniture, appliances, TV’s & electronics, wood, drywall, metals, etc. 4. Do you see people/businesses becoming more aware of the issues with plastics? Or other potential recycling materials? Can you give some examples? - Yes l believe that people and businesses are becoming more environmentally conscious or concerned about issues with our wide spread use of plastics locally as well as globally. A great example of this is the recent state wide ban of the plastic bag in California. Furthermore, environmental disasters like the floating mass of plastic in the Pacific Ocean known as the ‘Great Pacific Garbage Patch’ is acting as a giant wakeup call and a catalyst for change. 5. What are the benefits of doing plastic recycling? Any statistics that you could maybe give? - The environmental benefits of plastic recycling are far reaching. Consider, as we mentioned in a recent blog post (Plastics: A Complex Issue), since the 1950’s, over a billion tonnes of plastics have been thrown away and between 60-80% of all debris found in our oceans and waterways are plastic. Can you think of a more compelling reason to recycle plastics? 6. Where do you see your company in 1 year? In 5 years? - In a year from now I see Green Coast Rubbish continuing to make headways towards adopting and developing new practices in achieving even a greater diversion rate (currently 76%) while also exploring and executing options for lowering our Carbon Footprint. - In five years from now I see Green Coast Rubbish running 100% of our fleet on alternative energy sources, being an entirely paperless organization (we are nearly there), providing waste management / recycling solutions to new sectors and closer to our aspiration goal of achieving a 100% diversion rate for all the material that we remove for our clients. Special thanks to Eamonn and Green Coast Rubbish for taking part in this interview. 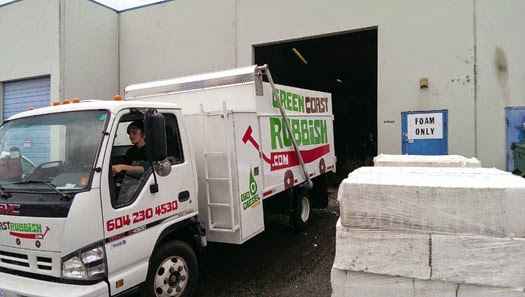 Check out Green Coast Rubbish's Website here! Also, here is a link to their Facebook Page and Twitter Feed. This blog focuses on the local green economy, green business leaders, and sustainability issues. Please like us on Facebook and follow us on Twitter for more updates and information!